Wednesday the weather reports forecasted strong westerlies, and when I returned from the local Gréolières bakery to our gîte at 8 AM we already had our first wind gusts. So we decided not to fly. Instead we went to St.André to meet up with the pilots that are flying the last round of the British Open there this week. To our surprise it was calm in St.André and a task was set. 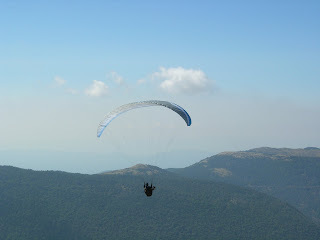 It was nice to see some 130 gliders take off and struggle along the ridge. We spent some time in the local paragliding shop and then saw the first people come down in the landing field next to the shop. That seemed a bit too fast and indeed, the task was stopped due to strong winds. In the end we left St.André with one new harness and one new helmet :). On the way home we went to see the ever beautiful Gorge du Verdon, and had a refreshing bath in the fast flowing Verdon river. And then had a walk around the little alpine town of Castellane, before heading home to Gréolières again. Yesterday the weather was perfect again. We left early for the Lachens site. The idea was to fly from there back home via the Col de Bleine, a flight of 27 km. The weather surely was "on" in Lachens, and soon the boys were exploring the Lachens mountain for lift (picture). Initially the inversion was a bit low, but soon it raised and cumulus started to form. So after a little while all four left the mountain and glided towards Col de Bleine. It seemed that they all didn't cross the valley in a suficiently direct way and hence Jorma, Jori and Tomi landed near Seranon. Juha catched another thermal low there but then did choose a too difficult route and landed near Andon. Nevertheless nice 1-2 hour flights for all. In the afternoon we all flew another 1-3 hours at Gréolières in very buoyant conditions. After a shower we analyzed the day a bit over dinner and decided to try the same trip again today (Friday).